The Criminal Code (French: Code criminel) is a law that codifies most criminal offences and procedures in Canada. Its official long title is "An Act respecting the criminal law" (R.S.C. 1985, c. C-46, as amended). 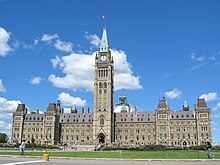 Section 91(27) of the Constitution Act, 1867 establishes the sole jurisdiction of Parliament over criminal law in Canada. The Criminal Code contains some defences, but most are part of the common law rather than statute. Important Canadian criminal laws not forming part of the code include the Firearms Act, the Controlled Drugs and Substances Act, the Canada Evidence Act, the Food and Drugs Act, the Youth Criminal Justice Act and the Contraventions Act. One of the conveniences of the Criminal Code was that it constituted the principle that no person would be able to be convicted of a crime unless otherwise specifically outlined and stated in a statute. This legal document has played a major part in Canada's history and has also helped form other legal acts and laws, for example, the Controlled Drugs and Substances Act. The main body is followed by schedules (i.e. appendices) relating to some of the above-mentioned Parts and a series of prescribed legal forms, such as Form 5 which sets out the proper legal wording for a search warrant. Ousting from Canadian criminal law any offence under an Act of the British Parliament, "unless such Act is, by the express terms thereof, or of some other Act of such Parliament, made applicable to Canada or some portion thereof as part of Her Majesty's dominions or possessions." Standardization of the age of criminal culpability, so that no juvenile under the age of seven could be convicted, and those between the ages of seven and thirteen could be convicted only where they were "competent to know the nature and consequences of the conduct, and to appreciate that it was wrong." An Act respecting Arrest, Trial and Imprisonment of Youthful Offenders, S.C. 1894, c. 58 July 23, 1894 Provided for the separation of juvenile offenders from older persons and habitual criminals during arrest, confinement, trial and subsequent imprisonment, as well as integrating efforts with those of children's aid organizations being organized by the provinces. The Juvenile Delinquents Act, 1908, S.C. 1908, c. 40 Implemented over time by specific proclamations, with respect to a specified province or a portion thereof. The Juvenile Delinquents Act was designed to operate in a similar manner to the Probation of Offenders Act 1907 passed by the British Parliament in the previous year, as well as the juvenile delinquent provisions contained in the later Children Act 1908. While the minimum age for those subject to the Act remained at seven years, the maximum age varied by province. By 1982, it was set at 16 in six provinces, 17 for British Columbia and Newfoundland, and 18 for Quebec and Manitoba. Criminal Code, S.C. 1953-54, c. 51 April 1, 1955 Reenactment of the Code, with modernization of provisions. It abolished all common law offences (other than for contempt of court), as well as any offences created by the British Parliament or in effect under an Act or ordinance in any place before becoming part of Canada. Criminal Law Amendment Act, 1968–69, S.C. 1968–69, c. 38 Various, from July 1, 1969 to January 1, 1970 An omnibus bill promoted by Pierre Elliott Trudeau, the Criminal Law Amendment Act, 1968–69 provided for the decriminalization of homosexual acts between consenting adults, the legalization of abortion, contraception and lotteries, new gun ownership restrictions as well as the authorization of breathalyzer tests on suspected drunk drivers. Young Offenders Act, S.C. 1980-81-82-83, c. 110 April 2, 1984. The Young Offenders Act raised the minimum age of criminal responsibility to 12 years, and standardized the maximum age to 16–18 years (depending on the province), as well as setting limits on the length of sentence that could be imposed. Anti-terrorism Act, S.C. 2001, c. 41 December 24, 2001 (principally) Enacted in response to the terrorist attack against the World Trade Center on September 11, 2001, the Anti-Terrorism Act included provisions regarding the financing of terrorism, the establishment of a list of terrorist entities, the freezing of property, the forfeiture of property, and participating, facilitating, instructing and harbouring of terrorism. Youth Criminal Justice Act, S.C. 2002, c. 1 April 1, 2003 The Youth Criminal Justice Act was passed to address concerns raised by the effects of the Young Offenders Act. ^ The citation of this Act by this short title is authorised by the English text of section 1 of this Act. ^ The citation of this Act by this short title is authorised by the French text of section 1 of this Act. ^ "1892, Canada's Criminal Code". Duhaime.org – Learn Law. Retrieved 2016-09-19. ^ Robin, Laura (26 May 1982). "Laws affecting young to change". Ottawa Citizen. p. 47. Canadian Legal Information Institute contains the CCoC in a searchable database.